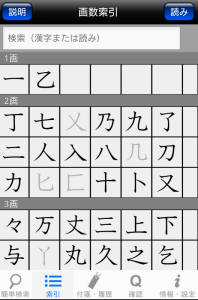 You can trace stroke order for the 2439 kanji characters that make up all of the kanji for common use learned in schools. 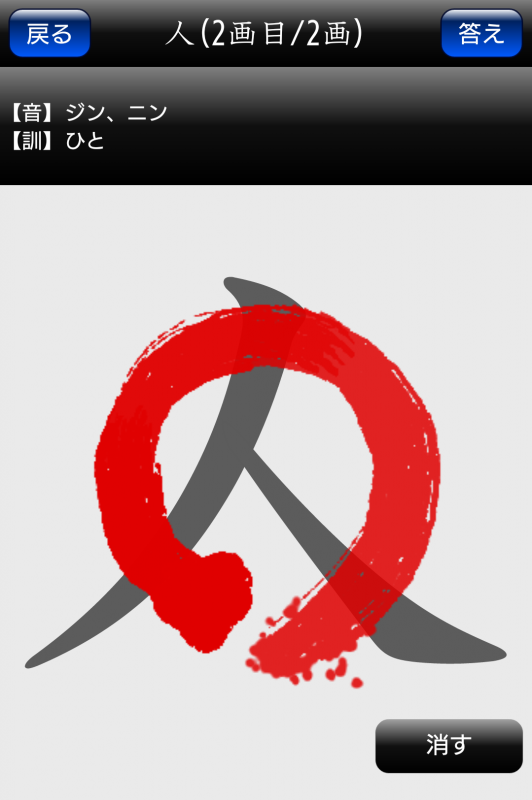 The 6027 readings included in these kanji have been compiled as well. 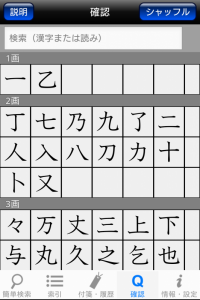 You can easily search for kanji through handwriting. You can use the "簡単検索" (Easy Search) function to search via kanji stroke order or readings written by hand. 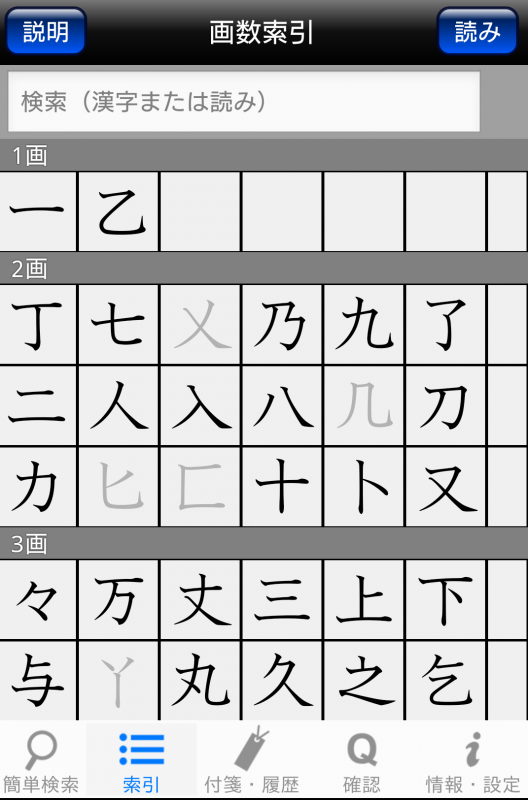 You can learn kanji while checking the stroke order. 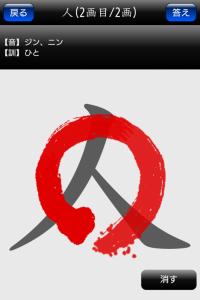 You can use the "付箋・履歴" (Record) function to record up to 100 kanji you searched for in the past. 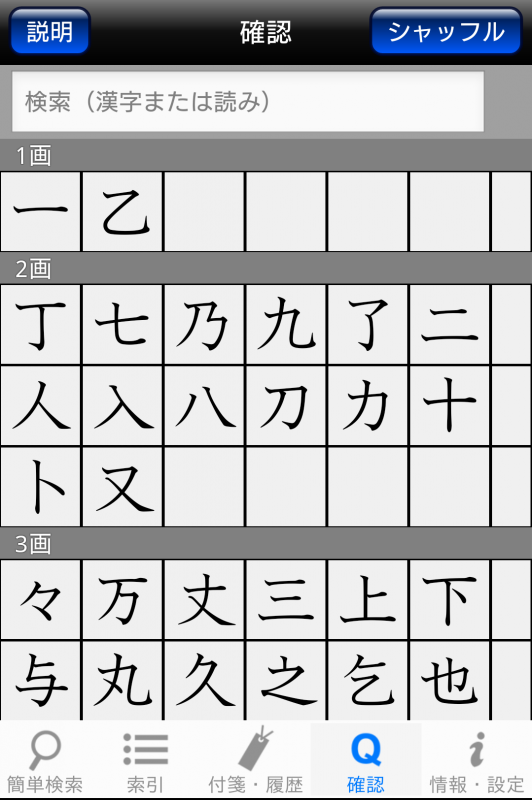 You can use the "確認" (Check) function to challenge yourself to stroke order questions. 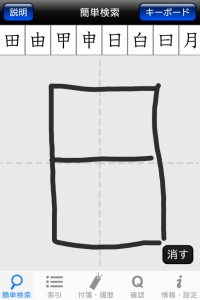 You can save searched kanji to the clipboard. 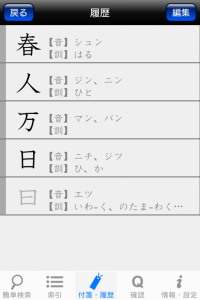 This app lets you understand stroke order, but the function that is great for Japanese learners is the "簡単検索" (Easy Search) function, letting you search for kanji with unknown readings or meanings through handwriting. 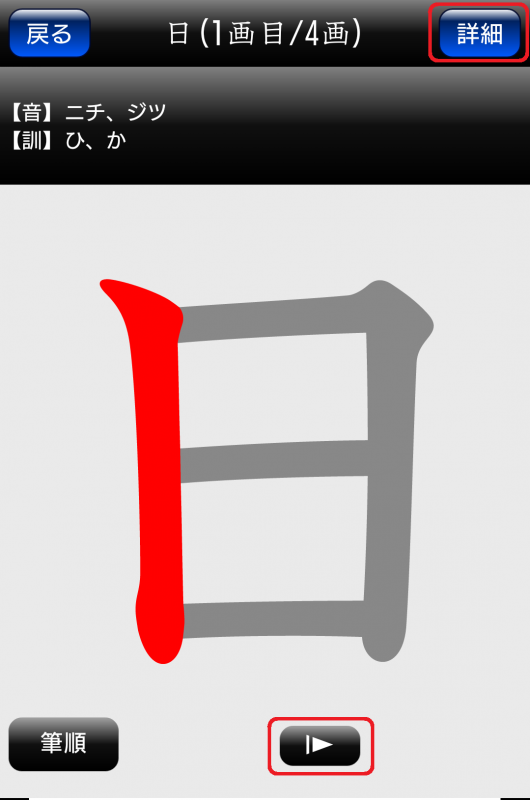 Even if the handwritten stroke order is incorrect, this app has a high level of recognition for handwritten kanji. 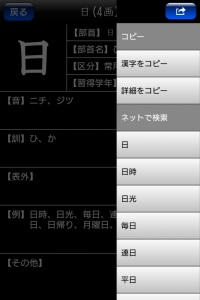 In most cases, the prospective kanji is displayed in the upper portion of the screen. 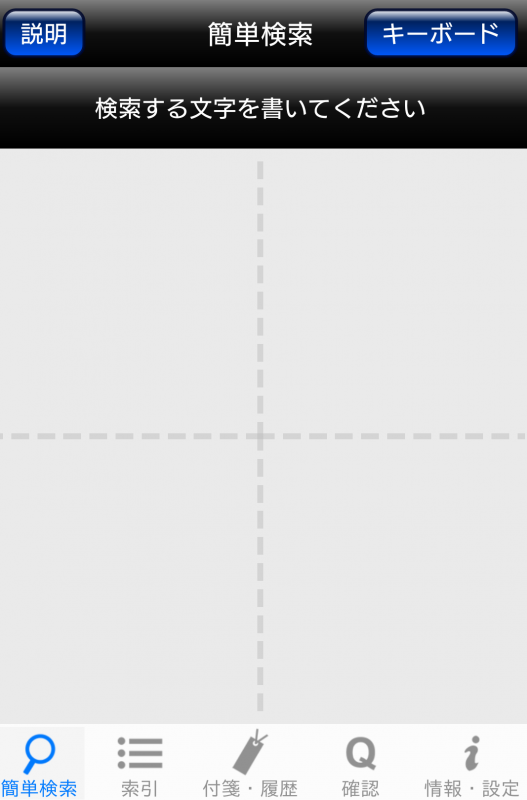 We tried to search for the kanji "日" using an incorrect stroke order. From the candidates that appear in the upper part of the screen, tap the appropriate kanji "日" and you can see its stroke order. 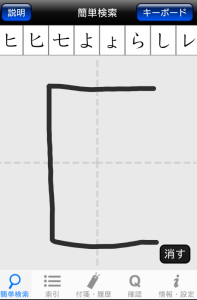 You can trace the red parts of the character, or you can tap the "→" arrow on the bottom of the screen to display the next part of the stroke order in red. 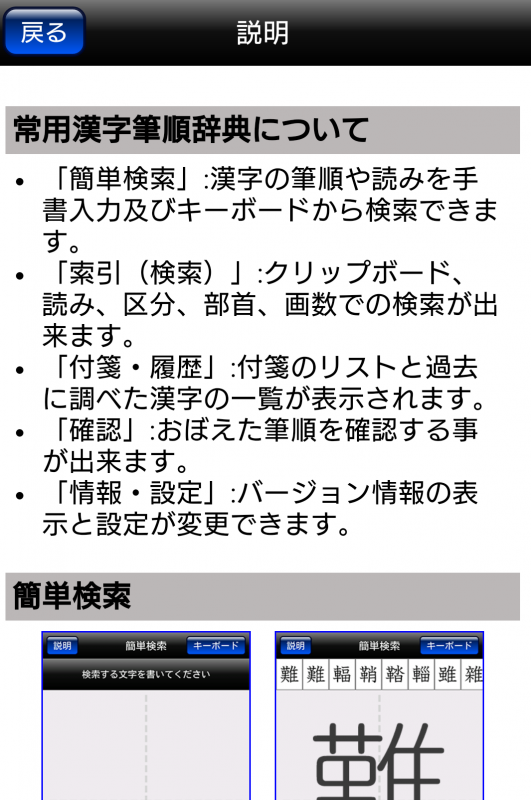 Also, tapping the "詳細" (Details) button on the top-right side lets you search for kanji readings, radicals, and sample kanji vocabulary. 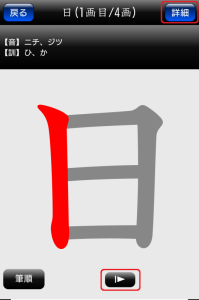 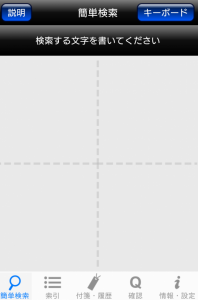 You can open the pull-down menu from the icon on the upper right hand corner of the kanji details screen and copy, too. All of the kanji detail information is copied onto the clipboard within the app so you can also paste it onto your notepad. 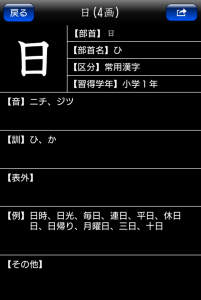 At the "索引" (List), you can search for kanji from 4 different indexes: "画数" (stroke count), "読み" (reading), "区分" (section, divided by the school year in which it is learned), and "部首" (radical). 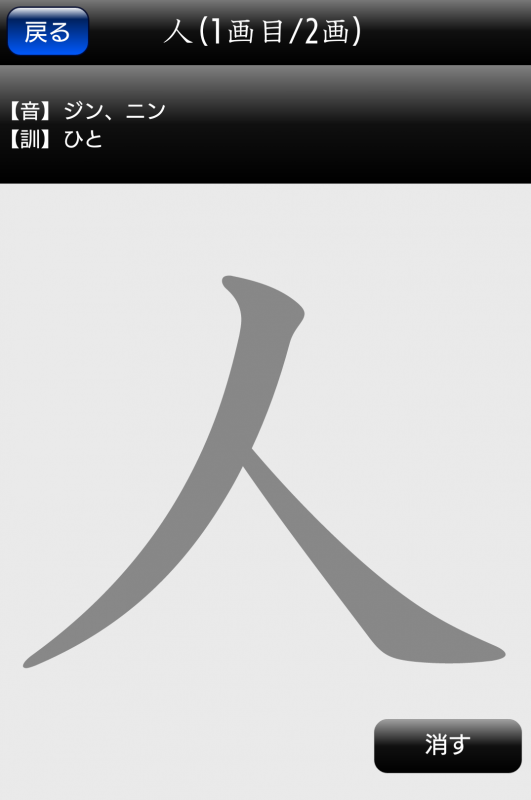 Up to 100 kanji search for in the past can be recorded in the "付箋・履歴" function, so you can use it to check whether or not you have remembered them. 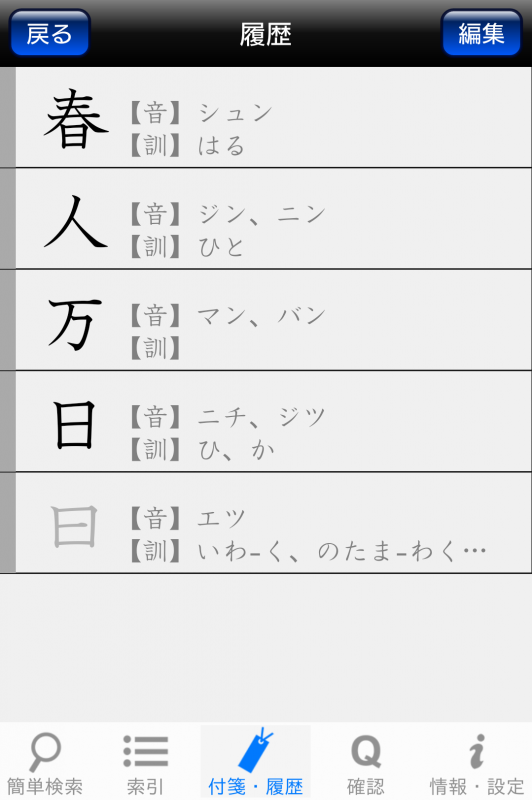 The "確認" function lets you choose kanji and take on stroke order questions. 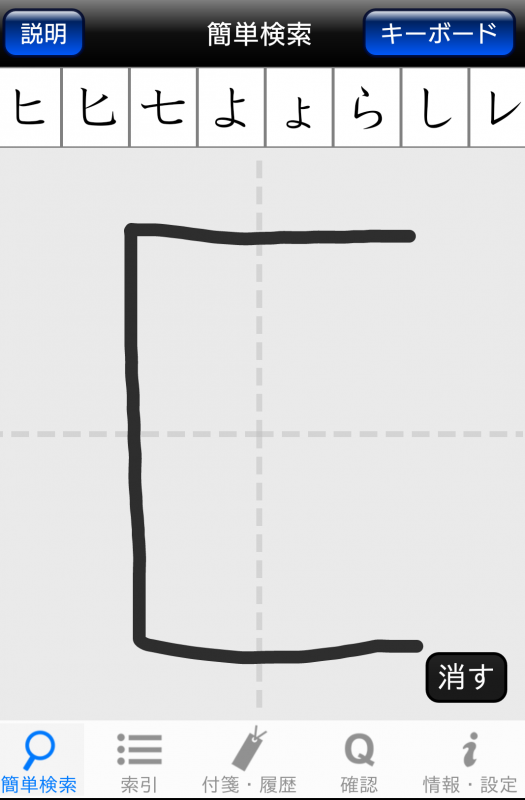 Trace the order you think is correct and it will tell you if you are correct. 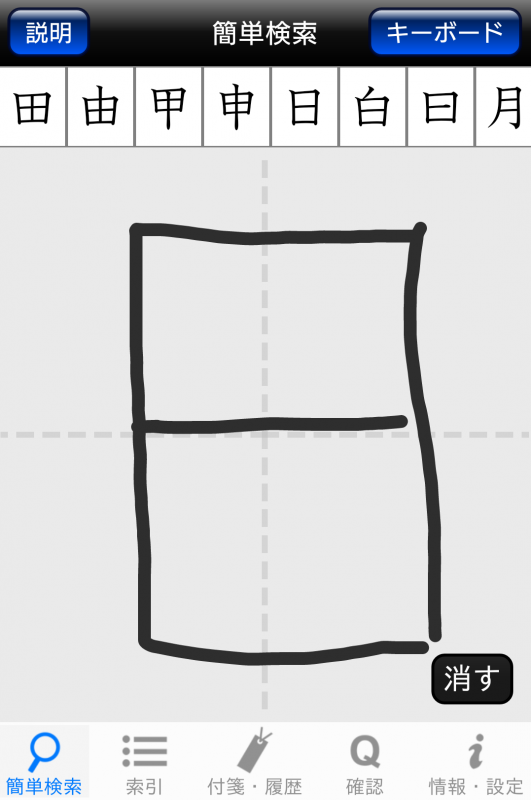 You can practice writing kanji while remembering the stroke order. 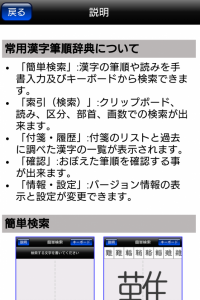 It is only in Japanese, but there are operating instructions as well.